You finally did it: you organized the pantry, that dark, ominous corner of your closet, and the “miscellaneous” toy box in the playroom. Now comes the next step…maintenance. Is there a secret weapon when it comes to keeping things under control? You bet, and it comes in the form of the label maker. My favorite is the Brother P-Touch D200 label maker because there is no end to the multiple uses for this lean little machine in the quest for organization. Here are just a few. Designate Spaces and Places: When you move into a new home, a label maker is a must have for establishing specific spots for all of your belongings. Be smart: choose locations for items near where you use them. For example, place drinking glasses near the refrigerator and keys by the door. Label the bins, boxes, or shelves where you place these items, and you’re one step closer to ultimate organization. 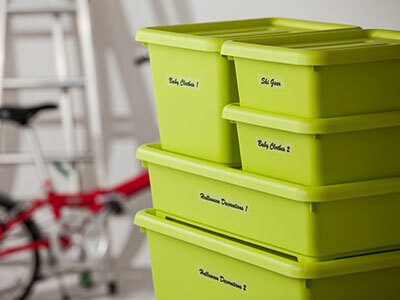 Enjoy Uniform Visuals: Select uniform containers to avoid visual clutter, and go a step further by using identical labels which are much neater than handwritten ones. Apply the same principle to your office files. The visual of typed labels on identical containers and folders will be an instant inspiration to maintain the organization you have achieved! Downsize Toys: Post-holidays, purge the bulky packaging on toys and games, and corral puzzles, legos, and blocks into labeled containers that take up less space, and are easier on the eye. Once you’ve downsized the toys, don’t forget to label the playroom shelves, so everyone knows which is home to the puzzles and where the games belong. Identify Yourself: Before embarking on a trip, or sending the kids off to school with new gear, put a label on it! Label everything from lunchboxes to suitcases, phones, tennis rackets and hockey sticks! This won’t stop your family from losing things, but will help others to find what they’ve lost! Create Kitchen Calm: Before storing that Tupperware in the freezer, add a label specifying the contents and the date to eliminate food gone bad and mystery meals. Use canisters that are labeled for dry goods like flour and sugar and marvel at how much better your pantry looks. Label your pantry shelves and their contents so everyone in the family knows where to find their favorite foods. Corral Cords and Chargers: Label chargers and cords according to what they are or who in the household uses them. This helps eliminate fights about whose charger it is and lessens the confusion about which charger goes with which camera. Remember Notes to Self: You may forget the size of the shoes stored in the closet, which box houses Halloween decorations and which houses the Christmas lights, or the flavor of those coffee pods. An extra detail on the label will give you a little more information and keep chaos at bay. Label Everything! It’s the only way to maintain an orderly home, and that is a “Label of Love”! 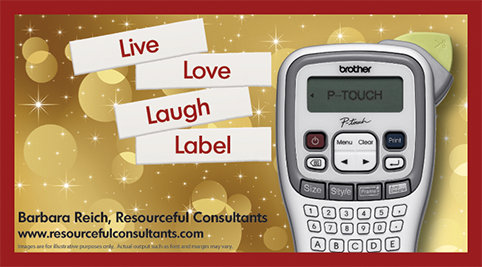 For more inspirational uses of the label maker, check out “25 Days of P-touch Labeling” at www.brother-usa.com/ptouch25!